Dr. Edgar John Boone, 84, of Raleigh, died on February 26, 2015. Boone was a long-time and very special member of the College of Education community. Boone was raised on a dairy farm in Varnado, Louisiana. He proudly served in the United States Air Force during the Korean War and he went on to receive his undergraduate degree from the College of Agriculture at Louisiana State University. His first job out of college was with the Cooperative Extension Service in Louisiana as a 4-H Agent in Tangipahoa Parish. He went on to get his masters and doctor of philosophy from the University of Wisconsin in adult education. There he met the love of his life, Ethel Marie Bower, and was married to her on July 19, 1959. Shortly after graduating, he began working at the University of Arizona with Cooperative Extension Services as Associate Director. He went back to the University of Wisconsin to become a professor in the center for training cooperative extension workers. 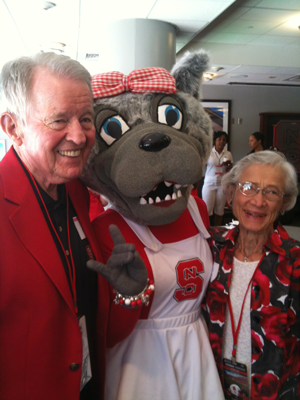 Boone and his family came to Raleigh in 1963, where he became the Associate Director in Cooperative Extension Services, and, he also founded and became the head of the Department of Adult and Community College Education at NC State University and held theW. Dallas Herring Professorship. He developed and validated a systems-oriented programming process that is being used by adult educators around the world in planning, designing, implementing and evaluating adult education programs. The students often referred to his course as “Booneology.” Those students often went on to be deans, presidents and vice presidents of community colleges and universities nationwide. He published multiple books and other materials on adult education during his career and received numerous awards including the Order of the Longleaf Pine and the national service Ruby Award connected with the extension service from the US Department of Agriculture. Upon retirement, he stayed on and established a pilot community college leadership program (ACCLAIM) at NC State University. Post retirement, he continued to work with many students in order to help them complete Doctoral and Masters programs in adult education. In his spare time, Ed loved to garden, travel, read history, and visit the beach. He also was a proud fan of the NC State Wolfpack. He had a strong work ethic and loved his family and students dearly. His students remember him as a professor who went to all lengths to assist them at being successful in their endeavors. Edgar is survived by his wife of 55 years, Ethel B. Boone; sons, John B. Boone and his wife, Sonya, and David W. Boone and his wife, Susan; grandchildren, Matthew D. Boone, Allison E. Boone and Sabrina M. Boone; and his brother, Hayward D. Boone and his wife, Dorothea, sister-in-law Jayne Garber, and by many loving nieces and nephews. Next academic year, the Leadership, Policy, Adult and Higher Education department will host a new event, The Edgar J. Boone Symposium, honoring his legacy.In lieu of flowers, the family is asking people to consider making a gift to the College of Education. Enter the amount and follow the instructions to complete the transaction.